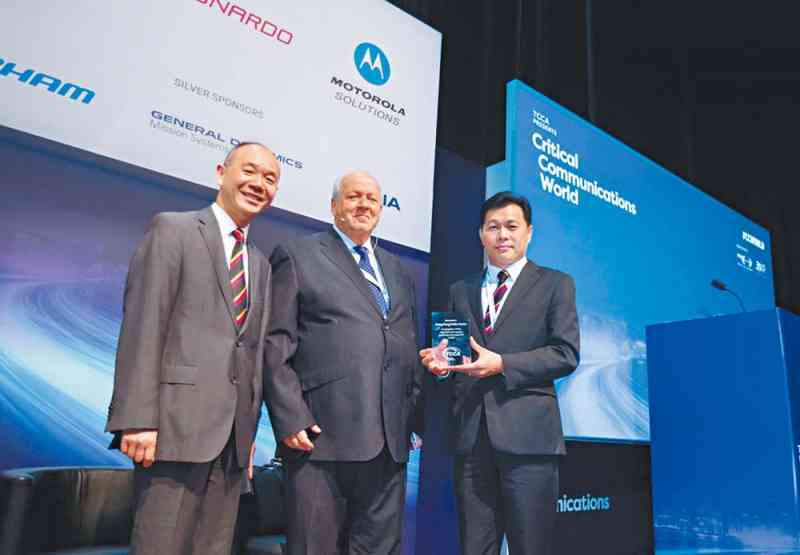 The Force received the Leadership Award from the TETRA and Critical Communications Association (TCCA) for its leading role in the field of critical communications at the 19th annual congress of the Critical Communications World in Hong Kong on May 17. TCCA is an international association that was established by professional mobile radio (PMR) users, manufacturers and service providers in 1994. The Force is the first public service organisation to win the renowned award for its Radio Communications System, which was developed on the common radio standard. PMR users from around the world in the field of public safety, transportation, public utilities and the military attended the annual congress, at which Secretary for Innovation and Technology Mr Nicholas W Yang delivered a keynote address. Meanwhile, Assistant Commissioner (Information Systems) Hui Chun-tak also attended the event and exchanged views with President of the Federal Agency for Public Safety Digital Radio of Germany Mr Andreas Gegenfurtner.